Hayabusa, which is coming closer to the earth for a swing-by, successfully acquired images of the earth and the moon on the 16th and the 17th. 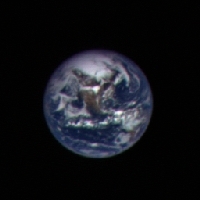 This earth image was acquired at 3:30 a.m. on May 17 (Japan Standard Time, JST). The distance between Hayabusa and the earth at that time was about 910,000 km. The image shows the south part of the North American Continent (Texas area) in the center, and you can also see the whole continent, the Pacific Ocean and the Atlantic Ocean in blue, and clouds over them. This moon image was acquired at 8:30 p.m. on May 16 (JST). The distance between the moon and Hayabusa at that time was about 710,000 km. The equator is in the center of the image, and the left is the north, and the right is the south. It is mostly the far side of the moon. A black spot on the upper right on the moon is a huge crater on the far side of the moon called “Mare Orientale (or Eastern Sea)”. The upper part of this moon image shows a part of the Oceanus Procellarum (the ocean of Storms) on the front side of the moon. The blackish part on the lower right seems to be Apollo crater (a part of the South Pole - Aitken basin). This moon image was acquired at 8:00 p.m. on May 17 (JST), about a day after the above image (1) had been taken. The distance between Hayabusa and the moon at that time was about 340,000 km. The area covered by this photo is about the same as the above (1), but as the distance became closer, the image was zoomed and clear. 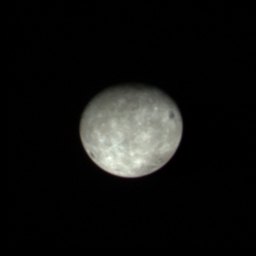 The black spot on the lower left seems to be the Mare Moscoviense (Moscow Sea).